Thinking of planning an important event or maybe a family vacation, you may want to check this map first. 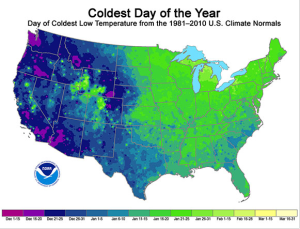 This is a “Coldest Day of the Year” map derived from the 1981 – 2010 averages of low temperatures for every day. From these values, the NOAA can identify which day of the year, on average, has the lowest minimum temperature. As you can see, on average the western half of the Lower 48 typically reaches its climatological coldest day in December, whereas most eastern stations reach their minimum in January.